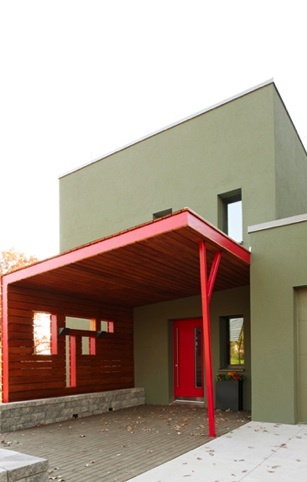 Passive House in the Woods, a project in Hudson, Wisconsin, was completed and open to the public in September. 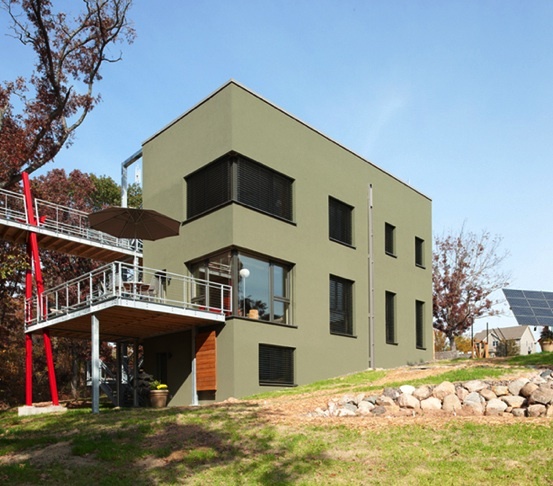 It was certified by Passive House Institute U.S. on October 14. 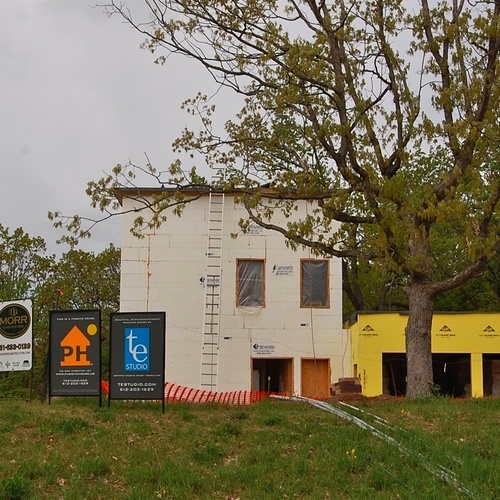 When we last checked in on Passive House in the Woods, a project in Hudson, Wisconsin, it was early May, exterior insulation was about to go up, and the construction crew was probably more than ready to welcome summer weather. Things stayed on schedule. 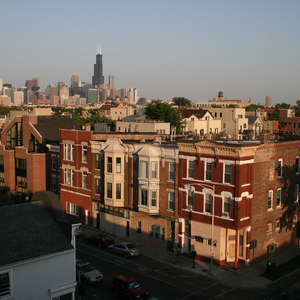 By the end of last month, construction had been completed and the house was open for public tours. 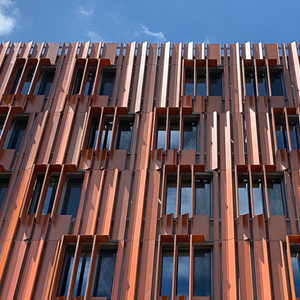 Last Thursday, the project received certification from the Passive House Institute U.S. The house – two stories, with three bedrooms and 1,940 sq. 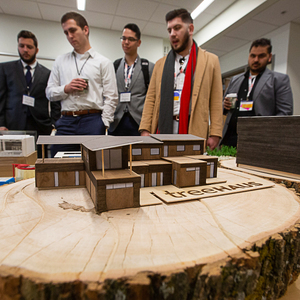 ft. of interior space – was guided to completion and Passivhaus performance standards by Tim Delhey Eian of Minneapolis-based TE Studio, and the project builder, Morr Construction Services of Shoreview, Minnesota. The client, Gary Konkol, a general-practice physician, explains in a post on the project’s website that he was inspired to pursue the Passivhaus standard in part by news reports, Passive House Institute’s book “Homes for a Changing Climate,” and Eian’s enthusiasm for the standard and the construction quality it entails. 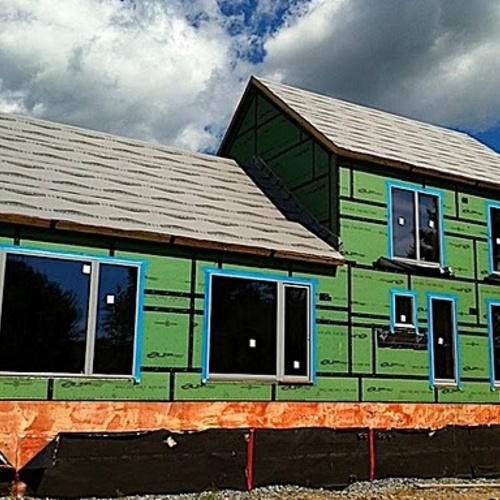 Passive House in the Woods, or PHitW, was constructed with 11-in. insulated concrete forms and an exterior-insulation and finish system that brought the overall R value of the walls to 70. The slab, sitting on 12 in. of extruded polystyrene, is designed to R-60 and the flat roof, with an average of 14 in. of of polyisocyanurate insulation, to R-95. 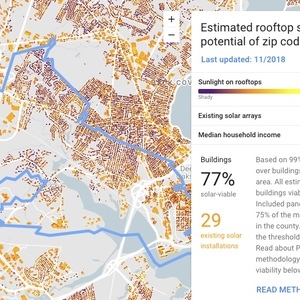 The building also is equipped with solar hot water and a 4.7 kW solar power system, which is expected to cover the home’s predicted 4,200 kWh annual usage and feed power back into the grid. The house has four doors to the outside (see comments below), including a front entry door in the front canopy area, one opening to the deck on the first floor, and another on the second-floor landing (known as “the plank”). 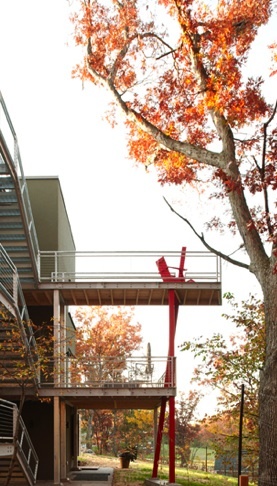 A common steel-structure stair connects all levels to the ground and a rooftop terrace. The conditioned space has 3 "doors" to the outside. The front entry door is an Optiwin Frostkorken Entry Door (R-value 9). The access to deck from the first and second floor are large Optiwin Alu2Wood windows which were sized to act as doorways. While the garage is physically attached to the house there is not an access from the interior of the house to the garage. The front of the garage comes out past the house and there is a swing door just to the north of the entry door which is hidden on the second photo. I made a mistake in my previous posting. The conditioned space has 4 "doors" to the outside. There is an additional Optiwin Alu2Wood window in the walkout basement level. Thank you for checking in on this. I've modified the text accordingly. 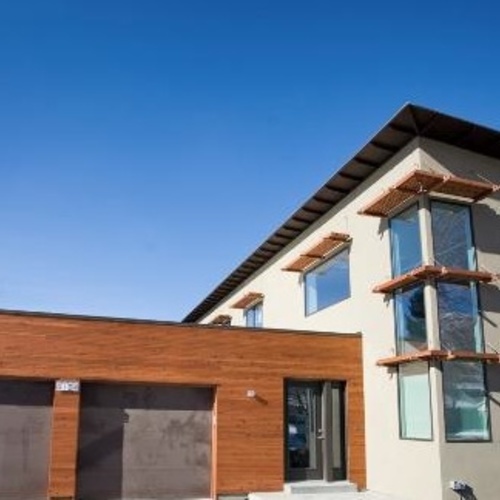 Pioneering Passive House in the Western U.S.